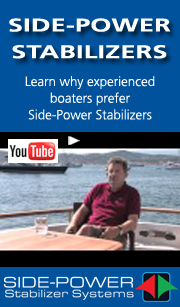 There is a limit to the power you can practically generate with DC electrical systems, so for super yachts and other larger heavier crafts DC thrusters are rarely an option. The greater thrust and extended run time make AC Electric thrusters a good alternative for commercial crafts and other less manoeuvrable yachts. All thrusters in the SAC-series uses the digital S-Link control system and can be used in combination with hydraulic thrusters on one S-link control bus. Our AC Electric thruster range from 450 to 1400kg of thrust for use as either bow or stern thrusters. For more information about AC Electric thrusters, please click one of the images below.